Railpictures.ca - Graydon Johnston Photo: With a pair of crew members riding on the nose (one being former OBRY operatior Steve Bradley who has since been promoted to BCRY after Cando handed the Owen Sub operations over to Trillium) CCGX 1001 makes its way across Young st in Barrie with a pair of tank cars destined to Comet Chemicals Ltd at the end of the line in Innisful. | Railpictures.ca – Canadian Railway Photography – photographie ferroviaire Canadienne. 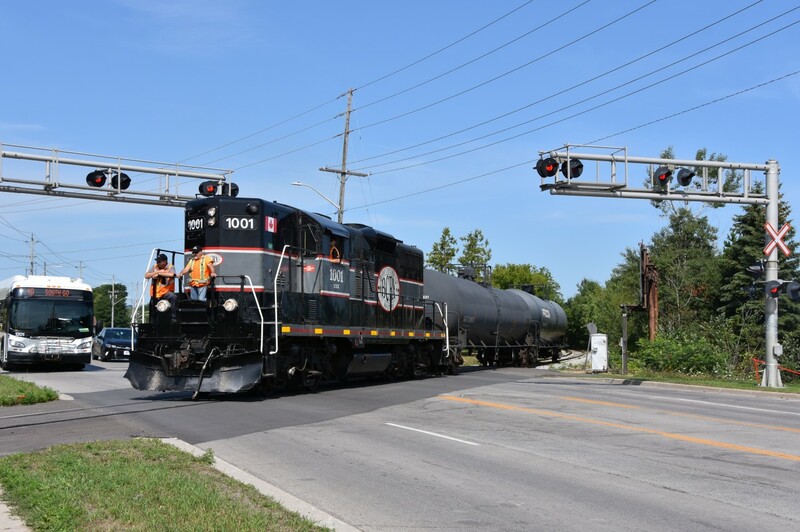 Caption: With a pair of crew members riding on the nose (one being former OBRY operatior Steve Bradley who has since been promoted to BCRY after Cando handed the Owen Sub operations over to Trillium) CCGX 1001 makes its way across Young st in Barrie with a pair of tank cars destined to Comet Chemicals Ltd at the end of the line in Innisful.